Welcome to our four-bedroom, beach-side home with a cool beach vibe. PLEASE NOTE, PRICE SHOWS AVERAGE, click on the dates you require, you'll be surprised to see how reasonable our nightly price is. Sunny with indoor/outdoor flow looking directly over the sand dunes and beach reserve/beach access. 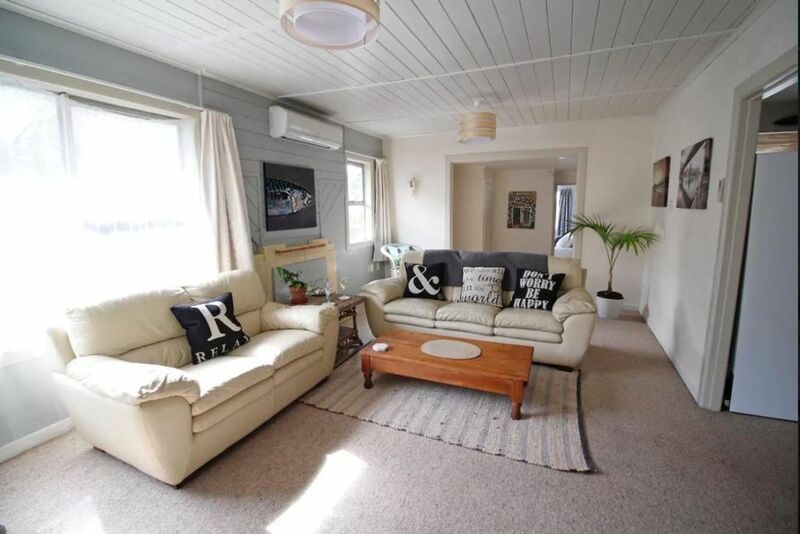 Close to all amenities makes this is a perfect destination for your next Papamoa beach/Mt Maunganui get-a-way. Fully furnished bedrooms can sleep 7, with an additional double fold-out couch and double foam mattress can sleep 11 total if need be. Two living spaces means enough room for large groups. Full Internet access, Freeview TV available. Separate bathroom (with toilet and bath) shower, as well as an additional toilet. This is an older kiwi bach, so please don't expect new. Dine in the indoors or in the sunny outdoor areas. The beach is straight across the road, so be prepared to hear the surf at night. Located just a few minutes drive away from busy mall, Palm Beach Plaza, fast food restaurants, beach front restaurants, cafes, shopping. 10-12 minutes drive to Bay Aquatics Leisure centre, Baypark ASB arena, Bayfair Mall and 15-20 minutes drive to main beach Mount Maunganui shops. This kiwi-style character home is not perfect, but has a relaxed beach feel reminding you where you are. Would mostly suit families and we'd prefer longer-term stay over Christmas and New Year. Available in peak season. Off road parking for up to three cars. Located on a main road, so some traffic noise to be expected. Please TURN OFF HEATING OR COOLING appliances before you leave to avoid any additional costs for power. Don't expect a new house when you book. Would suit family groups and mature guests. No smoking indoors, no pets. All house instructions and information - access to keys, wifi, tv settings etc given via email contact. Please be mindful of the neighbours in terms of loud noise. No loud parties on the premises or parking cars up the shared driveway. Cars can be parked on the front lawn of the house. Leave the house as you found it - clean and tidy. Please take your recycling with you, otherwise an additional $50 will be charged. Love travelling and spending time at the beach with the kids. Can sleep up to 11 guests and close to many shopping, sporting, holiday amenities. Beach across the road. 250metre walk. A good old kiwi bach right across the road from the beach. We stayed with family and friends while in the Bay of Plenty for a wedding. The bach was a great meet up point for everyone and had everything we needed. Thanks Tess. We loved this place! Would definitely come back. Was perfect for our needs. Thanks very much as we had a great stay at the Mount. Very lovely, it was suited to our needs especially with young children. Location perfect. Perfect for a Family Holiday! Everything was perfect for our holiday. We all had our own rooms which were a plus since we had been sharing hotel rooms previously. Beautiful location, the hosts were very responsive. We locked ourselves out the first day and the host was there within minutes.